The American Cities of the Future 2013/14 rankings were published recently by the fDi Intelligence division of the U.K. Financial Times. The rankings are designed to identify the most promising destinations around the world for future inward investment. Data were collected for 422 cities relating to more than 70 criteria, grouped into five main categories: Economic Potential, Human Resources, Cost Effectiveness, Infrastructure and Business Friendliness. Each city was awarded a score out of 10 for each criterion, with the criteria weighted by their importance to the FDI (Foreign Direct Investment) decision-making process. The top ranked city in the Americas overall (for attractiveness for inward investment) remained New York City (which attracts 1% of global FDI), followed by Sao Paulo, Toronto, Montreal and Vancouver. In Latin America, Sao Paulo was followed by Santiago (Chile), Rio de Janeiro and Buenos Aires. The top-ranked Mexican cities were Monterrey in 6th place and Mexico City which ranked #8 of the top ten. Major (49 cities) – cities with a population of more than 750,000 people plus a metropolitan area of more than 2 million, or that are the center of a metropolitan area of more than 4 million. Large (52 cities) – cities with a population of more than 500,000 plus a metropolitan area of more than 1 million, or the focus of a metropolitan area of more than 2 million people. Mid-sized (80 cities) – cities with a population of more than 350,000 people or of more than 200,000 people plus a metropolitan area population of more than 750,000. Small (196 cities) – Cities with a population of between 100,000 and 350,000. Micro (43 cities) – cities with a population of fewer than 100,000. Mexico’s cities performed very strongly in the “cost effectiveness” sub-rankings, mainly due to their favorable wage rates. The top ten in the major city cost effectiveness rankings (with rank in brackets) included Puebla (4), Guadalajara (6), Monterrey (7) and Mexico City (10). Of these four cities, only Mexico City made the top ten for Business Friendliness. Mexico dominated the cost effectiveness rankings for large cities, taking eight of the top ten with San Luis Potosí (3), Cd. 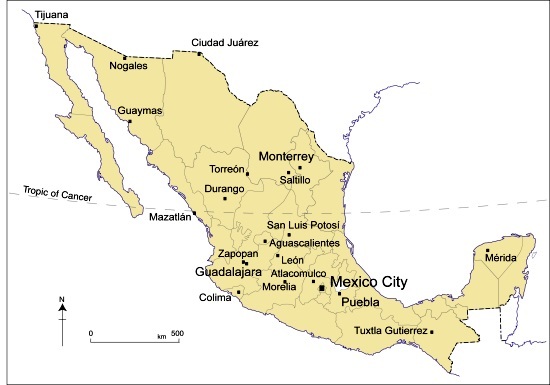 Juárez (4), Aguascalientes (5), Zapopan (6), Torreón (7), León (8), Tijuana (9) and Ecatepec (10) and did almost as well in the mid-sized cities category, with Mazatlán (5), Durango (6), Morelia (7), Tuztla Gutiérrez (8), Mérida (9) and Saltillo (10). Saltillo was the the top-performing mid-sized city for economic potential in the Americas, with strong GDP growth helping to entice investments, especially those related to vehicle parts and manufacture. In the cost effectiveness rankings for small cities, Guaymas (2), Colima (3) and Nogales (4) all made the top ten, while in the comparable listings for micro cities, Atlacomulco (in the State of Mexico) was the number 1 ranked city in the Americas. How tall is the average Mexican? Will Mexico City add cable cars to its mass transit system?